There is a lot to discuss in this installment, much of it due to my desire to ensure that every 915 transmission that I repair can last 100,000+ miles. That’s a lofty goal, after all, how many of these transmissions will be installed in a car that will be driven another 100,000 miles? Even late model manual Porsche transmissions are experiencing bearing failures at less than 100,000 miles, and a rebuilt exchange for those units will set you back $14,000+! I guess Porsche is using the modern-day printer philosophy; the profit realized with the sale of a printer doesn’t come close to the profit made on the sale of ink cartridges. The newest 911 fitted with a 915 transmission, at this writing, is about 24 years old. Granted, the cars are still suitable for daily driver use, but they are also entering the collectable zone. All things considered, I refuse to re-use bearings on a known transmission with more than 150,000 miles, or in any 915 with unknown mileage. I refuse to flip a synchro ring, or replace a synchro ring and pair it with a used slider. This terminology will become clear as we proceed. The next step in our repair is to disassemble the pinion shaft. You will read elsewhere about a variety of ways to do this, but I believe that the correct way is by using pullers and a press. Using a press has its advantages; the most important is that it will not stress any components or the shaft. Removal of the bearing closest to the pinion head is still tricky, the P-car tool, P 255A, is a tube that fits tightly around the outside of the pinion head and pushes against the inner race of the bearing. 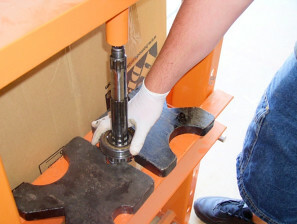 Without that tool, press plates can be arranged so the bearing can be removed without damage, but care must be taken to not push against the roller cage. For disassembly, I prefer to use a puller to remove the forward bearing along with 1st gear, and then remove 2nd gear through 4th gear by sliding them off of the shaft. This reduces the weight of the gear stack to a manageable level and makes the pinion shaft easier to handle in the press for removal of the bearings at the pinion head. Lift off 1st gear along with its needle bearing and bushing. Place it at the far end of your cardboard, just behind the already removed bearing and spacer/thrust washer. Lift off the sliding sleeve, aka slider, along with its spider (slider guide) and place them in line next to 1st gear. Remember, “away” or “down” side down. Continue in this manner with 2nd, 3rd and 4th speeds. …support the bearings with steel plates, and press the bearings off. As the press pushes the shaft through the bearings have your hand positioned so you can hold the shaft firmly, either above the bearings or under the pinion head. You will reach a point, after about an inch, where the pinion shaft becomes “free”, and will fall from the press if you’re not holding it. 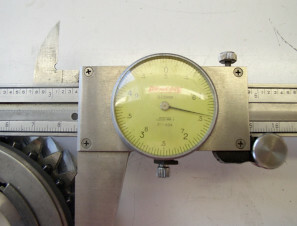 The raised, machined section of the shaft that holds the bearing is very short. 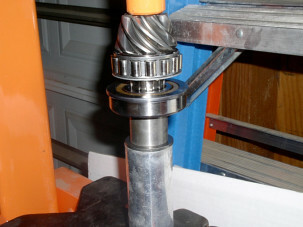 The bearings float on the rest of the shaft. Lift the shaft and bearings from the press and carry it to the workbench. 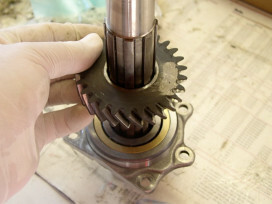 Place the shaft down on the flat part of the pinion head and lift the bearings off. 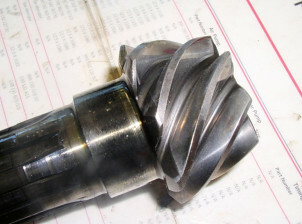 Clean the entire pinion shaft and examine the teeth of the pinion head; all of them, on both sides. No pock-marks in the smooth finish of the teeth are permissible for re-use. In other words, any wear that is through the hardened surface means that you are holding a thousand dollar piece of junk; or a paper weight that will be sure to be an unusual conversation starter at the office. Pictured below is a gear with wear-through that can, but rarely shows up on, a pinion gear (which is why I don’t have a failed ring & pinion to photograph for you). Look carefully at the teeth; you will see wear through of the hardened surface of the teeth. Unfortunately this has become typical of late, especially on 1st and 2nd gears, but we don’t have that problem on our subject. After pinion head examination, our gear is in excellent condition, we should take a quick look at the ring gear teeth. 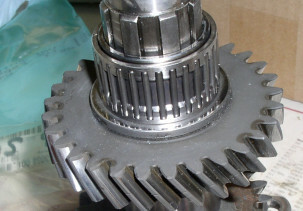 Because the ring gear is a far larger gear than the pinion head, the ring gear rarely shows terminal wear. However, it would be a shame to discover, after building a perfect pinion shaft, to discover a super-rare tooth failure on the ring gear. 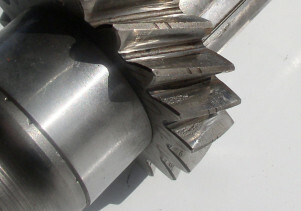 As is the case with other gears, the ring and pinion are matched for quiet running and long life, and they are both inscribed by hand with a common number. I should comment here that if the ring and pinion in your 915 requires replacement, due to the extremely high cost of tooling I recommend that professional help be considered. The rear bearing, part # 911 110 146 00, for the pinion shaft has been received, and the outer race for that bearing, along with the differential housing, have been shipped to the machine shop. We can put the bearing on the shaft, along with bearing part # 999 052 043 00. NOTE: “Front” and “rear” are descriptive terms used to indicate the position of a component when it is in its installed position in a car. For example, the “nose” of a 915 is the front of the transmission, while the “differential housing” is the rear of the unit. COMMENT: There was a time when I would do a synchro repair and put the transmission back together. Of course, we had a known user history for at least 90% of the 915s that I repaired, and we knew that pinion shaft and main shaft bearings had an expected life of 150K + miles. Today, the typical 915 has been removed from a car with 3+ owners, unknown mileage and unknown use. Some have come out of wrecked cars, some are sold as cores, and some have found their way to market as a result of a car being upgraded for sporting purposes. If a 915 is apart for repairs, and it’s anything other than a known “virgin” with less than 100K miles, the three pinion shaft and three main shaft bearings should be replaced. Our subject certainly appears to be in the “no bearing category,” but we just don’t know for sure because this 915 was purchased as a “core” unit, with a claimed mileage but no way to verify condition. Therefore, we will replace the shaft bearings, all six of them, which will virtually guarantee that no failure will happen before the demise of the synchros that we will also replace. 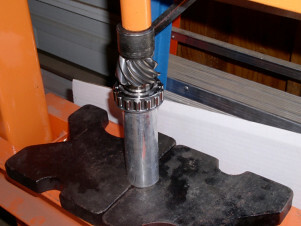 Place the pinion shaft in the press; slide the clean, dry bearing onto the shaft, set up the press tool (in this case a thick-wall piece of steel or aluminum pipe), and push the bearing home. 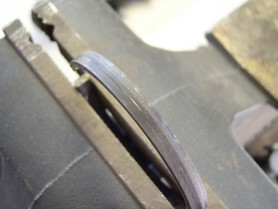 Be sure that the bearing is all the way on and tight against the back side of the pinion head. Use caution to push only against the inner race, never allow tools to contact the bearing cage or damage to the bearing will occur. 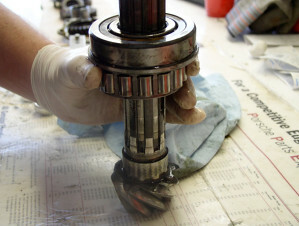 NOTE: The bearing surfaces that come in contact with another part must be clean and dry – no dirt, no oil, or no grease. Clean and dry; I wear latex so even fingerprints are eliminated. The next bearing, 043 00, on the pinion shaft is an interesting one. The inner race is a two-piece design, which leaves you with more than one way to install it. I like to push on the first inner race, place the bearing against it, push the remaining inner race on, and hold the bearing as I slide my press tool into position. You can see in the picture that my pipe is too big for the bearing race, so I use a spacer tube along with the pipe to press the bearing home. 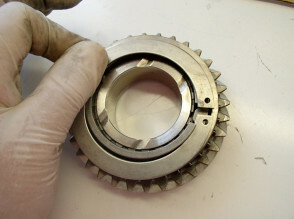 The 043 00 bearing has a flange on its OD, be sure that flange is at the pinion head side of the bearing. The bearing clamping plate is next. This is another item that you will read about, and it will seem that whomever you talk with will have a different opinion. Wear or damage to the main shaft bearing clamping plate is almost unheard of, so the focus of this discussion will be on the pinion shaft clamping plate. The plates are designed to control radial and axial play, but only to a point. 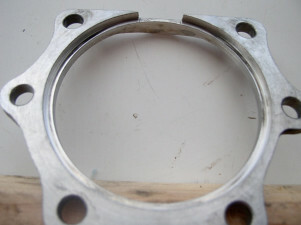 They cannot prevent bearing race opening (hole) failure. As you can see, the clamping plate has a machined recess that pushes against the flange of the 043 00 bearing, forcing it against the pinion depth shims and the 146 00 bearing. I could not guess at the original intent of the engineers regarding the clamping plates, because they also had to consider the axial and radial play of the bearings as well. The best explanation that I can come up with is that the pressure against the 146 00 bearing is not intended as a failure guard, but is the result of the design. 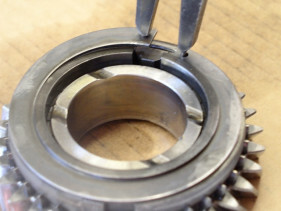 After the bearing race starts to spin in the housing, it also begins to develop a small amount of axial play, which allows the 043 00 bearing to move inside the clamping plate, which seems to cause the wear at the plate’s pressure point. That pressure point is thin, approximately 2.5mm, and when its wear reaches the point where the plate should not be reused, it will have a trough-like appearance. I’m not aware of a wear limit spec for the depth of the plate (shim surface to bearing contact surface), but a plate in usable condition should probably not measure more than 4.25mm. A visual inspection will reveal the wear/condition, and what is certain is that the forces generated in that part of the transmission exceed that of the designed limits. The clamping plates seem to be the forgotten part in the 915, almost as though the factory did not think wear to them was possible. NOTE: An interesting change was made to the design of the main shaft bearing and differential housing sometime during the 1984 Carrera 3.2 liter (type 915/68) production run. The size (OD) of the main shaft bearing directly above the troublesome pinion shaft bearing was reduced, from approximately 62mm to approximately 55mm, the result was an increase of the housing material between the 146 00 bearing location and the main shaft bearing location. This change strengthened the housing just enough to eliminate most of the loose pinion shaft bearing problems; finding a housing with the small upper bearing, and a loose pinion bearing, is rare. I’ve found the small bearing on 915/68 (1984) units, but I’ve also worked on 915/68s with the large M/S bearing. The change is almost certain to be found on all 915/73 (‘85/86) transmissions. 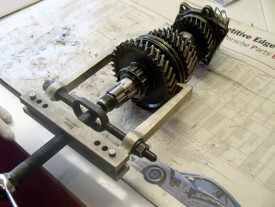 If the clamping plate requires replacement that’s when this gets tricky, because the pinion shaft plate is currently “NLA.” The three letters that send shivers up the spines of many P-car enthusiasts; NLA = No Longer Available. This leaves us two choices; (1) locate “new old stock” where the part is still available in a wholesaler/retailer’s inventory, or (2) purchase and use an aftermarket substitute. At this writing I’ve been successful with finding a factory replacement when needed, so, because I’ve never used an aftermarket alternative, I can’t report on those items. With the two bearings and the clamping plate installed, we can slip on the fixed gear of 4th speed. When you pick up the gear you will see that each side has a different wear pattern. Clean and dry the gear with a non-oil-based product like lacquer thinner, or aerosol parts cleaner, and slide it onto the shaft splines. The side with the wide, flat surface must go toward the bearing, and the side with the narrow wear mark will align with the spacer tube that goes on the shaft next. Clean and dry the spacer and slide it onto the shaft. Like 4th, 3rd speed also has a wear pattern that matches up to the spacer tube. Clean and dry the gear and slide it onto the splines until it seats against the spacer. Clean the thin spacer washer and slide it onto the shaft so it seats against the wide contact surface of 3rd speed. 3. 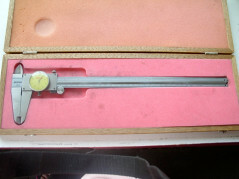 Vernier caliper (or micrometer) with measurement capability up to about 90mm. Experience needed? The more the better. Unlike ring & pinion replacement, synchro repair/replacement can be done with minimal expense for tools, although a dial indicator-equipped caliper will set you back a few bucks. 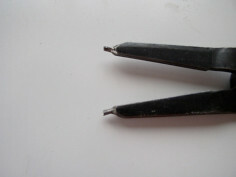 Regarding the snap ring pliers, I purchased them with oversized tips, which I ground and shaped until they did the job that I needed them to do. COMMENT: I have seen a host of hand-made/home-made tools, including ones intended to remove dog teeth. Most of them qualify for a character breakfast at Disneyworld – as a character. And you know which one. The problem with homemade tools is that they can break at inopportune times. When that happens they can hurt you. In addition, if a tool works perfectly one time, it might not work the next time. That is because home-made tools are usually constructed to do the minimum, rather than to tackle a worst case scenario. The dog teeth removal tool is a classic case, because some rings are not very tight, and some are so tight they might as well be welded. You will not see a home-made tool in this tutorial, unless I made it at my shop and it has passed muster. OK, 2nd gear. This is the gear that suffers the most traumatic failures, due mostly to the almost irresistible rush of acceleration in 1st gear, followed by a usually too fast shift into 2nd. I used to tell my customers who drove 911s fitted with 915s that every time that they exceed 4500 rpm in 1st gear was that much sooner that they were going to contribute heavily to the Red Line coffers. NOTE: I can’t possibly cover every failure scenario in this tutorial, so we’re going to do the basics on our subject. Before we take 2nd gear apart there are some things to know. The synchro ring has a sprayed-on coating that provides an incredibly durable, hard, friction surface. However, that surface does wear away over tens of thousands of miles, to the point where the synchro ring becomes smooth, even shiny, in places. Shiny means replace. 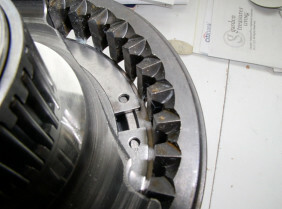 The two parts wear together, and because a wear pattern forms on the teeth of the slider, it must be replaced with its synchro rings. This project is starting to sound expensive, and we’ve just scratched the surface. We now know that we’re going to replace the 2nd gear synchro, the 1st gear synchro, and the 1/2 slider. You will read stories about how it’s OK to “flip” the synchro and re-use it (a procedure some do by taking a worn synchro and “flipping” it over so that the unused side faces the slider). This strategy might be viable in a racing transmission that’s little more than a high-rev crash box, but for a transmission intended for use in a nice street machine it’s absolutely unacceptable. Shifting quality will always be compromised because of how the synchromesh works. …compared with the teeth on a new dog ring (look carefully at the tips/points of the teeth). It is not unusual to find broken dog teeth, their small parts will eventually end up stuck on the drain plug magnet. 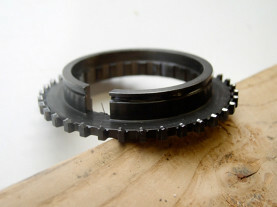 The installed dimension of the 1st or 2nd gear synchro ring is 86.37 +/- 0.17mm (76.3 +/- 0.18mm for 3rd-5th). If you were to take a worn synchro ring and flip it, and re-install it into a worn dog tooth ring, it will be able to expand to a larger than acceptable dimension. Combine that with a slider whose teeth have a wear pattern that conforms to the worn out side of the synchro, and you create a difficult shifting condition that requires a higher than normal level of force to shift the car. While those difficult shifts are made a second problem, one that affects longevity, occurs. The friction material on the “good” side of the synchro is carved away by the unmatched, used, slider, which can greatly reduce the synchro’s useful life. That friction material will then fly around the inside of the transmission, finding its way into bearings and around other parts. Not a pretty picture. Basically, flipping a synchro might sound good, but in reality has no upside. 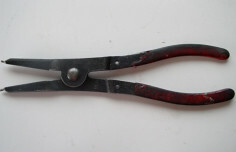 Pick up your snap ring pliers and remove the synchro retainer. It will be tight, be sure that the tips of your pliers are well-seated in the retainer’s holes, and hold your opposite hand so that if the pliers come loose under pressure they won’t hit your hand. Trust me, this can hurt. Set the retainer aside, lift out the synchro ring and internal parts. 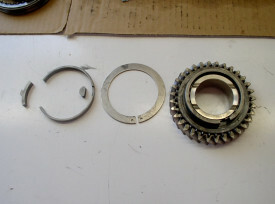 NOTE: 2nd gear synchro components are; (1) anchor block (smallest part in above picture), (2) energizer block, (3) brake band, (4) retainer, and synchro ring (not shown). Everything on our subject is in good condition, except for the synchro ring, and can be re-used. If your transmission has had a traumatic failure, you might (usually) find broken dog teeth, disfigured brake bands and blocks, in addition to other forms of damage. Although our subject’s dog teeth look very good, we’ll check them with a new synchro ring. Wash the 2nd gear components, they must be clean and dry (I’ll bet you’re getting sick of hearing that, huh? ), and assemble them using a new synchro ring. Installing the retainer can be tricky; place the gear with the open end of the synchro ring facing 9:00 o’clock, compress it into the dog teeth, and hold it down with your left hand, also at about 9:00, as you slide one end of the retainer, at 3:00, into its groove. Then, use your fingertips to keep the synchro compressed while you “walk” the retainer into place as far as you can go by hand. Put the pliers in place, spread the retainer slightly, and transfer pressure against the synchro to against the retainer without letting the synchro pop out of the dog teeth (sometimes this is very easy, the synchro will stay in place with very little help). Spread the retainer as needed when you get to the end still not in the groove, and use the pliers to push it past the lip of the dog tooth ring and down to the groove. Measure the synchro ring in at least three places, it will be slightly smaller near the opening, but that’s normal. If the ring measures outside the tolerance range, on the large side, the dog teeth will have to be replaced. If the synchro ring measures inside the allowed range you’re good to go. 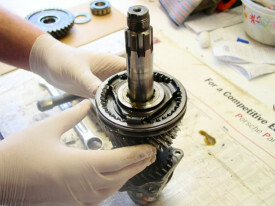 Slide the bearing bushing onto the shaft, install a new needle bearing, and slide the assembled 2nd gear into position. Let’s talk about that needle bearing. History has drummed into our heads to never replace a bearing without replacing that bearing’s race(s). What we’re doing here is replacing only the bearing. Tough decision. The bushing is less than $50, but the gear is in the many hundreds of dollars. 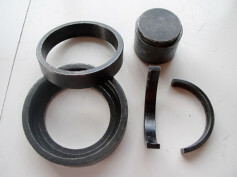 If the bearing surface of the bushing, and the gear, both look good, replacing just the bearing works. This is when experience is your friend. I’ve done this countless times without a problem. So far, we’ve spent $557.17. Math: $557.17 + $2553.53 = $3110.70. Ouch. And that number does not include 1st gear dog teeth (approx. $200.00) or any still to be discovered nasty surprises. Granted, money can be saved by careful shopping for the above listed parts. Just for fun, let’s knock off an even $1,000.00 that could be saved by carefully choosing your parts source(s). That still leaves us with about $2100.00 of expense, without repair labor or the pinion shaft bearing/differential housing reinforcement cost (usually $300-400). Those numbers should set off all of your warning bells every time that you see a “rebuilt” 915 advertised for $1500.00. Our subject, worn but with a bright future, will cost us at least $2600.00 to repair, not counting our labor (eight + hours at $100/hr). A true “rebuild” would cost thousands more, so what exactly are you getting when you buy that $1500.00 transmission? I’m going to end Part III here and let us all recover from sticker shock.